MR. HEALY: You will recall, Sir, that you mentioned, I think yesterday, that the Tribunal would make a further Opening Statement today in connection with some of the material which has come to hand over the past few days, and which may to some extent alter or at least expand the focus of the Tribunal’s work over the next remaining part of these sittings. You will recall that the last Opening Statement was mainly in two parts. The first part dealt with the Terms of Reference which concerned Mr. Charles Haughey. The second part concerned Mr. Michael Lowry. This additional Opening Statement is effectively supplemental to the second part of the last Opening Statement which concerned Mr. Michael Lowry almost exclusively. In that earlier Opening Statement the Tribunal focused on four items. Firstly, the $50,000 US Telenor/ESAT payment. Secondly, the £147,000 payment into an Isle of Man account in the name of Michael Lowry, which was described in that Opening Statement as the Carysfort Avenue/David Austin payment. Thirdly, the Mansfield transaction. And fourthly, the Cheadle transaction. Each of those two transactions were property transactions. In that Opening Statement, Mr. Coughlan set out the information then available in something approximating to historical chronological order concerning those four matters, that is to say, concerning the circumstances in which payments were made in each of those four cases. The Tribunal indicated that it was its intention to examine both the circumstances surrounding each of these items individually and the various overlapping relationships between the persons who appear to have been involved in them, namely, Mr. Lowry, Mr. O’Brien, the late Mr. Austin, and Mr. Aidan Phelan who then appeared to play a subsidiary role in relation to some, but a more central role in relation to others, of those matters. discussions generated an amount of paperwork. The Tribunal has been seeking access to this paperwork and has now managed to overcome a number of legal difficulties, with the result that some, though as yet not all, of this material is now available. As of this moment, the Tribunal believes that it has probably accumulated sufficient material to enable it to provide a reasonably accurate outline picture of what occurred. I hasten to add that these difficulties arose due to a number of technical points relied on by some of the entities holding these documents. It is important to bear in mind that these technical arguments would, if accepted, be perfectly valid and the Tribunal is not anxious to become embroiled in technical arguments where privilege or confidentiality attaches to documents where it believes it can otherwise gain access to the relevant material. At the same time, I think it’s important to bear in mind that in the case of both the Fine Gael Party and Mr. Denis O’Brien, the Tribunal has now been afforded access to all material of any kind, whether covered by any claim to confidentiality, privilege or otherwise. events, effectively one event, were brought to the attention of the Tribunal by Mr. Barry Maloney, the former joint Chief Executive Officer of ESAT Digifone, and latterly the sole Chief Executive Officer of ESAT Digifone. I think Mr. Maloney has now moved on to a non-executive position with the company. Mr. Maloney was recruited to a senior executive position with ESAT Digifone some time after the announcement of the decision to grant the second GSM licence to that company. It appears that he had done some limited work in connection with the competition, but did not become really active with the company until around 1996. Mr. Maloney informed the Tribunal that sometime in or around September or October of 1996 he had a discussion with Mr. Denis O’Brien concerning payments which, as Chief Executive Officer, he was obliged to sanction in connection with the work done in the competition for the second GSM licence. These payments were mainly in the nature of what has been called or what have been called success payments, that is payments due to consultants and others engaged by ESAT Digifone solely for the purpose of promoting its competition bid, and which payments were contingent or presumably partly contingent on the success of that bid. Mr. Maloney wished to clarify the obligations of the company with regard to those payments and had complained to Mr. O’Brien about the lack of invoices to vouch the claims of the various consultants or others to whom success payments appeared to be due. Mr. Denis O’Brien was anxious that Mr. Maloney should sanction the payments so to ensure the people entitled to them were paid and to avoid delay in meeting these obligations. I think the way Mr. Maloney understood it, Mr. O’Brien wanted Mr. Maloney to get on with making the payments. In response to Mr. Maloney’s complaints concerning the lack of paperwork to enable him to process these payments, Mr. O’Brien remarked that he himself had had to make two payments of £100,000, one of which was to Michael Lowry. Mr. Maloney has informed the Tribunal that this discussion took place in the offices of ESAT Digifone. Mr. Maloney’s response to these remarks of Mr. O’Brien was to say that he didn’t want to know any more about them, that they concerned a period when he wasn’t an executive of the company, and as far as he was concerned, that was the end of the discussion at that time about them. recognised that the requirement to examine the documentation generated in the course of various discussions concerning the Prospectus in 1997 had become more urgent. It was for this reason that, in the course of examination of Mr. Arve Johansen to date, and the examination to date of Mr. O’Brien, that certain matters could not be scrutinised in detail or could not be scrutinised as completely as it will now be necessary to examine them. It is clear from the documentation which has now been made available that the Tribunal will have to make a much more wide-ranging inquiry into the events surrounding the preparation with the Initial Public Offering in November of 1997. To the four items warranting inquiry and which were mentioned at the Tribunal’s last Opening Statement will now have to be added a fifth item as well, namely, whether there was in fact a payment by Mr. O’Brien to Mr. Lowry at some time prior to September or October of 1996. In addition, in the examination of the overlapping relationships between the various individuals in connection with the four items mentioned at the Tribunal’s last Opening Statement, this further matter will assume considerable significance. From the information which has now been made available to the Tribunal, it would appear that there are a number of different versions of what transpired between Mr. Maloney and Mr. O’Brien in 1996. There are also a number of different versions as to what transpired in the course of the IPO discussions in 1997 which concerned that 1996 conversation and other related conversations between Mr. O’Brien and Mr. Maloney. Most of the documentary material concerning the matters to which I now intend to refer has been made available to the Tribunal by ESAT Digifone, ESAT Telecom, by Mr. Barry Maloney, and by Mr. Denis O’Brien. The Tribunal is in the process of endeavouring to obtain further documentation from Telenor and IIU, and it anticipates that this further documentation will be to hand within the next few days. I think at this point it might be useful if I were to say a word or two about the relationship between ESAT Digifone and the other ESAT affiliates or ESAT associated entities. The second GSM licence was awarded to ESAT Digifone Limited. That was the vehicle used by the successful consortium for the award of the licence. As of the date of the award of the licence, that is to say the 16th May, 1996, and not the date of the announcement of the winner of the competition, the shares in ESAT Digifone appear to have been held as to 40% by ESAT Telecom, which was Mr. Denis O’Brien’s corporate vehicle; as to 40% by Telenor; and as to 20% by IIU Nominees Limited. It would appear that the shares in IIU Nominees were beneficially held for Mr. Dermot Desmond. As of November of 1997, that is at the time of the ESAT Telecom Initial Public Offering, ESAT Telecom and Telenor had each acquired a further 5% interest from IIU Nominees, so that at that time the shares in ESAT Digifone were held as to 45% by ESAT Telecom, if you like, Mr. O’Brien’s vehicle; as to 45% by Telenor; and as to 10% by IIU Nominees Limited. Subsequent to the ESAT Telecom IPO, both ESAT Telecom and Telenor again increased their respective shareholdings by each acquiring a further 4.5% interest from IIU Nominees, so that the shareholding in ESAT Digifone was by then held as to 49.5% by ESAT Telecom; 49.5% by Telenor; and 1% by IIU Nominees Limited. As at this time, the shares in ESAT Telecom and in ESAT Digifone have been acquired by British Telecom, so that BT, as it is known, now owns both ESAT Telecom and ESAT Digifone in their entirety. From the information recently provided to the Tribunal and from the documentation to which I have just referred, it would appear that in late 1997 there were a number of discussions between Mr. Barry Maloney and Mr. O’Brien concerning the remarks which had been made by Mr. O’Brien earlier, that is to say in 1996. Mr. O’Brien, as I will indicate, denies that he ever paid £100,000 to Michael Lowry, or a second £100,000 success fee to another party. Mr. Michael Lowry, denies that he ever received £100,000 from Mr. Denis O’Brien. However, Mr. O’Brien has not denied either to Mr. Barry Maloney or to any other of the individuals involved in the IPO that he made these remarks, although he does deny that he ever stated that he ever made a payment to Michael Lowry. In other words, he does not deny that he made a reference to two payments of £100,000 in connection with the granting of the licence. At the time of the IPO, the questions which were exercising the mind of Mr. Maloney and the minds of a number of other individuals were as follows. This is a summary of a much wider canvass in which these questions were being considered: whether these statements of Mr. O’Brien had in fact been made. Secondly, whether, if made, these statements were true, whether, in other words, Mr. O’Brien had in fact made two payments of £100,000 to two different individuals, one of whom was Mr. Michael Lowry. If true, obviously there were huge implications for the IPO, in particular if there were a connection or an apparent connection between a payment of £100,000 to Mr. Michael Lowry and the granting of the second GSM licence. It was also a question whether the remarks were true or not, and whether or not the truth or falsity of the remarks could be established in advance of the issue of the Prospectus. In addition, it was a question as to what extent these remarks ought to be disclosed, either in the Prospectus or to other interested parties involved in the IPO. 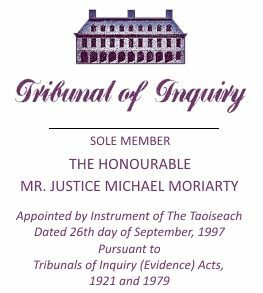 There was also, of course, the question around this time, and as we know, for some time afterwards, whether these statements, true or not, or whether the truth or not of them could be established, should be disclosed to the Moriarty Tribunal which had been set up in the course of the preparation of the IPO. The vast bulk of the material to which I have now referred, or to which I will now refer, was provided by ESAT Digifone and came from the custody of Messrs. William Fry solicitors. The documentation was generated mainly by Mr. Owen O’Connell and Mr. Gerard Halpenny, then both partners in William Fry solicitors in connection with the dealings between the various interested parties in the IPO in 1997. Mr. O’Connell, who is now the managing partner of William Fry solicitors, has provided the Tribunal with an account of the circumstances in which this documentation came into being. He has informed the Tribunal that he acted as solicitor to ESAT Telecom at or around the time of and for some years prior to the time of the IPO. As Mr. O’Connell has informed the Tribunal, as is now fairly well-known, Digifone had won the competition for the granting of the licence on the 25th October, 1995, and thereafter embarked on the process of rolling out or creating the mobile phone licence network. The launching of this mobile phone network occurred in March of 1997. Sometime after the launch, Mr. O’Connell was informed by Mr. O’Brien of Mr. O’Brien’s intention of proceeding with a public offering of shares in ESAT Telecom, and he set the Autumn of 1997 as the time at which this would occur. ESAT Telecom’s shareholding in ESAT Digifone formed a large portion of ESAT Telecom’s overall value and was probably the main attraction for investors in ESAT Telecom at that time. Mr. O’Connell has informed the Tribunal that for that reason some degree of cooperation from ESAT Digifone was required for the ESAT Telecom flotation. The first document I want to refer to of the documents provided by Mr. O’Connell is a memorandum of a meeting on the 22nd October, 1997, at the offices of William Fry solicitors. Mr. Denis O’Brien and Mr. Aidan Phelan, an associate of Mr. O’Brien’s, called to see Mr. O’Connell, and they told him that Mr. Barry Maloney had asserted that a statement had been made to him by Denis O’Brien to the effect that he, Denis O’Brien, had made payments to two individuals, one of whom was Mr. Michael Lowry, in connection with the ESAT Digifone bid for the second GSM licence. Mr. O’Brien insisted, in the course of the meeting, that there was nothing in the allegation; as he put it, it was destructive and that spreading it would be damaging to all, especially the company, that it was akin to starting a fire in a cinema, and that it was neither responsible nor necessary to inform the board of ESAT Telecom. In particular, he stated, according to Mr. O’Connell’s note, that he had made no payment and that he could refute any assertion of Barry Maloney to that effect in the box, meaning, presumably, in the witness-box; that he could, in other words, swear to that effect. Now, the Tribunal has been provided with photocopies of these memoranda, but has also very helpfully been provided with typewritten transcriptions, if you like, of these by Messrs. William Fry solicitors. It won’t be necessary to go into the detail of all of these documents at this stage, but as this is the one in which it would appear this matter was first brought to Mr. O’Connell’s attention, I should perhaps go through it. It’s a note to file dated 22nd October of 1997, the client is ESAT. And the matter is IPO. Underneath that you have the initials “DOB,” Denis O’Brien, “A Phelan,” meaning that Mr. O’Brien and Mr. Phelan were at a meeting in Mr. O’Connell’s office. Next note is “Discussion re Barry Maloney allegations. ML” — Michael Lowry — “per run payment.” The reference to the word “run” is a reference, as will appear later on, to Mr. O’Brien’s account of where and how the discussions he had with Mr. Maloney arose. Mr. O’Brien says that they arose not in the course of a discussion in Mr. Maloney’s office, but rather while they were having a run in the Wicklow mountains. “ML” refers to Michael Lowry. The note goes on: “Digifone board discussions and pending meeting. Likelihood of Barry Maloney being called and repeating allegation (50/50: 90/10)” in other words, this was an assessment of the likelihood of him being called to discuss those allegations and obviously of his repeating them. Next note is “Possible consequences discussed,” and then, “Denis O’Brien to refute etc.” The next portion of the note has been deleted, I hasten to add not by Mr. O’Connell on behalf of Mr. O’Brien, but rather by ESAT Digifone, who technically have the dominion over these documents at this time. Messrs. McCann Fitzgerald, acting for ESAT Digifone, have directed that this portion of the document be obscured on the grounds that it contains information protected by legal professional privilege. Next we have a privileged deletion again. Next a statement apparently attributed to Denis O’Brien. “No need for concern, assurance nothing in it.” Signed at the bottom by Mr. Owen O’Connell. Now, that meeting took place on the 22nd October of 1997. From other information made available to the Tribunal by ESAT Digifone, and in particular by Mr. Barry Maloney, the Tribunal has been provided with an amount of documentary material relating to the period from in or about the 8th October, 1997, onwards, but in particular material relating to the period prior to the meeting between Mr. O’Brien, Mr. Phelan, and Mr. O’Brien’s adviser, Mr. O’Connell. From these documents provided by Mr. Barry Maloney, it would appear that Mr. Maloney had become concerned about the statements made by Mr. Denis O’Brien, and about the question as to whether they were true or false or otherwise needed to be resolved. Over a period of time in early to mid-October, Mr. Maloney was concerned that he might have obligations to disclose this conversation he had had with Mr. O’Brien in the context of the IPO, and that in any case he had obligations to disclose it to his directors and, perhaps, wider obligations of disclosure. He was also concerned that he might have, or that the company of which he was Chief Executive Officer, ESAT Digifone, might have a liability in the context of the IPO if the statements were not disclosed or if representations were made in the course of the IPO to which these statements might be relevant. He had a number of meetings with Mr. Denis O’Brien with a view to seeking to persuade Mr. O’Brien to postpone the IPO. He has informed the Tribunal that in or around the 8th October, 1997, he had a meeting with Mr. O’Brien in Mr. O’Brien’s office in the Malt House, and also, I think, in a street near the Malt House or at the side of the building, in which he pleaded with Mr. O’Brien to postpone the IPO until after the Moriarty Tribunal. He made a similar request on the 13th October, when they discussed the matter both in Mr. Maloney’s office and over coffee in a nearby public house. He was unsuccessful in seeking to persuade Mr. O’Brien to postpone the IPO in both those meetings, and obviously, as we know, was unsuccessful in all his other efforts to persuade him to postpone it. But in any case, it would appear from the information provided by Mr. Maloney, that on the same day that he had a discussion with Mr. O’Brien over coffee in a public house near his office on the 13th October, he had a further meeting attended by himself, Mr. O’Brien, and Mr. Michael Walsh of IIU, that is to say the company representing Mr. Dermot Desmond’s shareholding in ESAT Digifone. The purpose of that meeting was to bring these matters to the attention of not only Mr. O’Brien, but also now another shareholder in IIU, with a view to seeing whether Mr. Maloney’s concerns could be allayed. It would appear also that by this time Mr. Maloney may have brought the matter to the attention of ESAT Digifone’s legal advisers and that he was in receipt of advice from Messrs. McCann Fitzgerald, from Mr. Fergus Armstrong, solicitor of that firm, concerning the matter. In any case, notwithstanding the intervention, if I can put it that way, of Mr. Michael Walsh of IIU, Mr. Maloney’s concerns were not allayed, and what is more, he failed to persuade Mr. O’Brien to postpone the IPO. He had a further meeting with Mr. O’Brien on the 14th October, in which he again failed in his attempt to convince Mr. O’Brien to postpone the IPO. It would seem that in addition to Mr. Michael Walsh, Mr. Dermot Desmond also became involved in the matter at this time, and in the course of a telephone conversation between Mr. Dermot Desmond and Mr. Maloney on the 14th October, 1997, Mr. Maloney informed Mr. Desmond of what had transpired between himself and Mr. O’Brien. Mr. Desmond informed Mr. Maloney that as far as he was concerned, they, meaning ESAT Digifone, didn’t know that anything had been done by Denis O’Brien, or that anything Denis O’Brien may have done had anything to do with ESAT Digifone and that it could have had to do with ESAT Telecom business. He directed Mr. Maloney that it was his job to make sure that ESAT Digifone was fully protected, that is to say, fully protected in the context of any statements made in the IPO documentation. Around this time, and for sometime afterwards, Mr. Maloney was endeavouring to promote the drafting or crafting of a disclaimer to be inserted in the Prospectus in such a way as to protect ESAT Digifone, its employees, and directors from any liability which might ultimately follow in the event of the statements made by Mr. O’Brien proving to be true, or in the event of there being any liability for failing to disclose those statements, whether true or false, or in the event of there being any liability for failing to take any steps in relation to establishing the truth or falsity of those statements. There was a lot of, if I can put it this way, to-ing and fro-ing between Mr. O’Brien and Mr. Maloney, all, it would appear, to no avail, for as Mr. O’Connell’s file shows, by the time that Mr. O’Brien and Mr. Phelan went to discuss the matter in William Fry solicitors, it had become clear that Mr. Maloney was still anxious to discharge what he believed to be his obligation to disclose these matters to the other directors of ESAT Digifone and to its other shareholder, that is to say, to the directors representing Telenor and to Telenor itself as the other shareholder. A question which was arising at that stage and which was no doubt exercising the minds of those directors of ESAT Telecom who were aware of this, was as to the extent to which the other directors of ESAT Telecom had a right to be fully informed of these matters. It would appear that by the 30th October of 1997, the issue, together with other questions concerning the $50,000 payment to Fine Gael, had become issues for ESAT Telecom and for its directors. In other words, these two matters had become issues for the company which was making the public offering. On the 30th October of 1997, Mr. John Callaghan and Mr. Leslie Buckley, both directors of ESAT Telecom, and once again Mr. Aidan Phelan, called to see Mr. O’Connell concerning Mr. Maloney’s statements regarding the remarks made by Mr. O’Brien. Now, once again, we have Mr. O’Connell’s note of that meeting and his very helpful transcription. The memorandum is headed “A note or a memo to file from Mr. O’Connell,” client is ESAT, and the matter is the IPO, and it’s dated 30th October 1997. The attendance is “JC,” meaning Mr. John Callaghan; “LB,” meaning Mr. Leslie Buckley; “AP” meaning Mr. Aidan Phelan; and “OC” meaning Mr. Owen O’Connell at the offices of William Fry solicitors. Next item says “KD,” which I think is a reference to Knut Digerund, an executive of Telenor — “consumed with rage, pull IPO over and over.” As Mr. Digerund was not at the meeting, I presume this is a reference by somebody at the meeting to the views Mr. Digerund had been expressing in connection with the matter. “2. Letter from ESAT Digifone Board to Chairman of ESAT Telecom re concerns on Prospectus.” This is a reference to a matter which is of purely technical reference and needn’t concern us at the moment. “3. Payments, Denis O’Brien/Barry Maloney discussion and FG” — in other words, that identifies the two items, the first set of payments relating to the Denis O’Brien/Barry Maloney discussion, and the second set concerned with the $50,000 payment to Fine Gael. The next word is “intermediary,” and I’ll come to the significance of that word in a moment. The next word is “Woodchester?” Then you have “other £100,000?” – presumably a reference to the other £100,000 payment. Then “payments stuck,” and I will come to the significance of highlighting those words in that way in a moment. “Etc. per FA,” meaning the Fergus Armstrong letter. It goes on then, “Arve checking re FG money,” meaning Arve Johansen, presumably, checking re the Fine Gael payment. Next, “Inquiry of DFTA,” – David FT Austin? Next item “JC, Telenor insisted and John Callaghan/Leslie Buckley agreed to consult WF” — William Fry. Next it says, “per Fergus Armstrong, “common” directors.” While this may require some clarification, I think it refers to the common directors of ESAT Digifone and ESAT Telecom. Then it goes on, “Statement from Woodchester definitely needed.” Again I’ll explain the significance of that in a moment. Then underneath that, a note that the Prospectus was being issued on the following Tuesday week, printed on the following Monday week. “Owen O’Connell letter held till Monday. Owen O’Connell to consider the matter Friday. Consult Chairman Saturday. Write to the board Monday. JC notifications quote from two by statements,” which I think is reference to statements, whether formal statements or not, from Barry Maloney and Denis O’Brien concerning these matters, and then there is two phone numbers. Now, it would appear that at that meeting Mr. O’Connell had received a document described as “Draft Statement of Denis O’Brien to McCann Fitzgerald,” and this was one statement made by Mr. O’Brien concerning these matters, and I think I should read it at this point so as to be able to make some sense of the references in the notes of Mr. O’Connell. Now, it would appear that by that date the 30th October, 1997, Mr. O’Brien had made other statements concerning the £100,000 payment to Mr. Michael Lowry, and had, in particular, suggested that at one point he had an intention of making a payment of £100,000 to Mr. Lowry; that what had prompted him to do this was the fact that Mr. Lowry was being assailed in the press; that he also had some financial problems in connection with his company, Streamline; that he, Mr. O’Brien, had gone so far as to earmark funds, a sum of £100,000 for transmission to Mr. Lowry; that these funds had been placed with an intermediary, or that they had in some way got stuck with an intermediary either before or at the time when Mr. O’Brien thought better of his intention to benefit Mr. Lowry in this way; that he did not go ahead with the transmission of any money to Mr. Lowry, and that he never paid Mr. Lowry the money in question either in that way or in any other way. Apparently at one point he indicated that the funds had been earmarked in Woodchester Bank, and that this was the intermediary to which he had referred and with which the payments had got stuck. Now, in addition, as the notes made by Mr. O’Connell made clear, one of the propositions being canvassed at that time, on the 30th October, 1997, was the conduct of an inquisition by a member of the firm of McCann Fitzgerald with a view to endeavouring to elicit the facts from either Mr. O’Brien and/or Mr. Maloney. It was envisaged that this inquisition or examination would deal not only with the question of a £100,000 payment to Mr. Michael Lowry, any other £100,000 payment to a party, but also the payment of $50,000 to Fine Gael. Mr. O’Connell made preparations in anticipation of being instructed to take part in such an investigation. He has produced a note of conversations he had with Mr. Michael Walsh of IIU and Mr. Denis O’Brien on the 31st October, in which, once again, some of the matters under review were being canvassed. It may be that in this discussion Mr. O’Connell was recalling solely what transpired at a meeting or conversation between himself and Mr. Michael Walsh, although it would appear that Mr. Michael Walsh may have been relating to Mr. O’Connell details of what he had learned in the course of meetings with Mr. Barry Maloney and Mr. Denis O’Brien. It’s again a William Fry file note. It’s not dated, with the result that Mr. O’Connell has had some difficulty in placing it precisely in terms of the latter end of October of 1997. Next line: “No real discussion of second £100,000.” “Monday, 13th October 1997,” – a reference to the first meeting between Barry Maloney, Michael Walsh, and Denis O’Brien. That was part of the series of meetings I referred to earlier in this Opening Statement. Underneath that there is a reference to John Callaghan. Underneath that another reference to what had been said by Mr. Maloney. “BM had said in his document stuck in intermediary. Denis O’Brien was asked who intermediary was and said Wood” — meaning Woodchester. On the 1st November of 1997, Mr. O’Connell travelled to Boston to meet with Mr. Denis O’Brien. Mr. O’Brien was, by this time, in the US promoting the public offering of shares in ESAT Telecom. He was working on the west coast, it would appear, and as Mr. O’Connell had to travel from Ireland, it was agreed that they would meet in Boston. In preparation for this meeting, Mr. O’Connell analysed the issues in the course of his plane journey. He reduced his analysis to a number of handwritten notes and in these notes raised a number of queries. It would appear that at sometime in the course of his discussions with Mr. O’Brien, he received responses which related to these queries, and these responses are noted on his handwritten notes. Because they raise many of the issues with which the Tribunal will be concerned, and because they identify many of the issues of fact which any lawyer will have identified as pertinent, they can be usefully referred to at this stage. It’s on William Fry notepaper. It says, “Plane, 1/11/1997.” Underneath that a memorandum from Mr. O’Connell to himself to get a chronology. Then what follows appears to be a form of analysis. I hope that Mr. O’Connell will correct me if I am wrong in any of these as I go along. And in relation to those queries or that analysis of the issue, Mr. O’Connell has noted that the subject arose in the context of discussion about invoices, and that presumably would appear to suggest that there is some common ground between Mr. Maloney and Mr. O’Brien as to what prompted the discussion. In relation to further references, it would appear that it was mentioned in the context of the establishment or the Terms of Reference of this Tribunal. On the next page, “Why reasonable for directors to accept comments of such a potentially serious nature made in jocose,” then quote “Bravado.” Presumably a reference to what the directors of ESAT Telecom should make of these comments. Was it reasonable for them to accept that comments of such a potentially serious nature would have been made in a jocose way or by way of bravado? Next section of the analysis deals with “Where” — where did the discussion take place? Where were the remarks made? And in brackets “disagreement” I think I’ll have to go over that again, because I may have been right in my initial instinct. What this deals with is where the discussion took place, and is there a disagreement as to where the discussion took place, and there is an analysis of this disagreement. “Where does Barry Maloney allege?” And there is a note, “Denis O’Brien’s office.” Underneath that, “runs regular?” And then to the right-hand side, “Purpose of the runs: Business/social?” These appear to be responses of some kind. Underneath that, “Any triggering event causing remembrance.” Then there is a note, “ankle sprain,” and as will appear in the course of the evidence, this was suggested as a potential triggering point of one or the other, Mr. Maloney or Mr. O’Brien, to date the discussion. Underneath that, “Diary. Weekends away. Sick, etc. Barry Maloney ditto.” Underneath that, “Barry Maloney says October/November, versus Denis O’Brien says October. 4 to 6 weekends versus 11” — being the range of weekends over which it could have occurred. “(One either end of month)” underneath that, “Check Sally Ann, re diary,” a reference to Mr. O’Brien’s personal assistant, I think. Next item is item number 4, “Second payment reference.” This is the reference to Mr. O’Brien having paid to or made two payments of £100,000. The subanalysis is “Relevance of question if the first denied?” Next point is, “No obvious suspect.” Obviously that meant no obvious suspect for the second payment, or was there? Underneath that, “Who would come to mind,” in Denis O’Brien’s mind? There is an answer, “Mitchell” and then “no, consultant.” And I think this is a reference to the fact that Mr. Jim Mitchell was, in fact, I think I can put it this way, an ordinary consultant and not a success fee paid consultant of ESAT Digifone. Now, item number 5, “DOB statement of the 23rd October of 1997.” This is a statement which the Tribunal does not have, but which from other documentation made available to the Tribunal appears to involve some of the explanations which I have already canvassed in this Opening Statement. The first item mentioned is “Stuck with intermediary.” That’s the expression that has already been mentioned in other notes of Mr. O’Connell. Underneath that, “Critical issue” — is this “an attempt, conspiracy etc. ?” Underneath that, an analysis of the Woodchester reference. “NB. John Callaghan call, confirmed Michael Walsh.” This is presumably a reference to some differences between Mr. Callaghan, Mr. Walsh, Mr. O’Brien, and Mr. Maloney, as to whether or not there were references to Woodchester. Underneath that is a reference to another expression which seems to have been used by Mr. O’Brien in describing his response or in responding to the discussion that he had made these statements, and he said, “Had thought about making a payment but chose not to do it.” Then underneath that there is a heading, “Further/supplementary,” matters requiring attention. Firstly, “Intention” — was there an intention to make a payment. Underneath that, “Contacts with Michael Lowry.” Then in brackets “(Catherine related? )” — I think there is a suggestion for which there is no foundation, or some relationship or some relation between Mr. O’Brien’s wife and Mr. Lowry and there is no such relationship. Underneath that, “Attempt/conspiracy issue.” This is revisiting some of the earlier ground, and that’s subdivided into “Acts designed to make or facilitate a payment,” which of course could constitute either an attempt or abandoned or failed conspiracy. If the statement is not made, he identifies an issue as to whether the board should still be told, “Still tell board, underwriters? (Board obligation, so advise, if matter material misleading etc. GFH)” — Gerry Halpenny is an associate of Mr. O’Connell. Underneath that, then, “Telenor, ad in paper?” Which seems to be a reference to some proposed form of disclosure. Underneath that, “FA” meaning Fergus Armstrong — “Communicate underwriters directly? Has he done so?” That analysis is followed by an analysis on the assumption that if the statement was made, and it’s broken down as follows: “Indication of intent or attempt.” Then in brackets, “(critical difference).” Underneath that, “Whether other(s) involved?” Underneath that, once again, “Intermediary — Woodchester or another (with an account in Woodchester? )” in brackets. It seems to go on then to another section of the analysis. “Why made?” Then hyphen ” – presumably after the licence. Then there is a section obscured. Again, as I hasten to add, not by Mr. O’Connell or Mr. O’Brien’s instructions, but on the instructions of ESAT Digifone. CHAIRMAN: I suppose, Mr. Healy, for non-lawyers present, it could be indicated that in general terms one must presume the deletions have taken place on a basis that the records purport to be legal advice to clients rather than recording what took place or what was said at specific occasions. MR. HEALY: Yes, I think I said that at the outset, that the Tribunal doesn’t necessarily agree that any of these exclusions or excisions are valid, but on the assumption that they do refer to real professional advice, then they would be valid. But hopefully they do not interfere with the Tribunal’s analysis of these matters. Then it continues – “BM apparently accepts no payment made. (Worth of this belief? -irrelevant)” Then there is a reference to “NB paragraph 6, intend not attempt.” Underneath that, “Conversation/contacts with minister” presumably. Item 7. “Verification or documentary evidence re relevant account at Woodchester, payments to or from account holder.” This is a reference to a possible way of verifying movements on Woodchester accounts connected with Mr. Denis O’Brien. I think Mr. O’Connell may have included that additional reference to Carysfort because he may have seen it or references to it in the newspaper at the time. It would appear that around this time Mr. Fergus Armstrong, solicitor of McCann Fitzgerald, will also identify a number of issues which I believed required clarification. In addition to dealing with his own analysis of the situation, Mr. O’Connell, when he arrived in Boston, also dealt with Mr. O’Brien’s responses to six questions raised by Mr. Fergus Armstrong. These questions, having been posed by a lawyer, once again focus on some of the issues to which the Tribunal will be devoting a considerable amount of attention, and for that reason it may be useful once again if I refer to them at this point. The next query in my set of notes, it’s between 4 and 5, I don’t have a number for it, and it’s headed, “The conversation –” In any case, it would seem to be in the same handwriting as the other documents, and presumably some of it was prepared by Mr. O’Brien. No doubt he will be able to be more specific about it. It’s headed “The conversation October/November.” “My recollection is that the conversation took place while running out in a mountain near Roundwood. However, it’s over a year ago. I can’t be absolutely sure,” and so on. November, 1997. It had become clear that in order to satisfy, even to a reasonable degree, anyone with a proper interest in these matters that such payments had not been made, it would be necessary to examine Mr. O’Brien’s bank accounts. It was also becoming clear that in order to establish that a $50,000 payment had actually gone to Fine Gael, some attempt would have to be made to track the payment from the time it left Telenor. Mr. O’Connell, I think as his analysis indicates, he intended to put in train inquiries with Woodchester Bank with a view to establishing what accounts were held by Mr. O’Brien in that bank in the previous two years, that is to say between November of ’95 and November of 1997. It was not envisaged that every transaction on those accounts would be examined, but only substantial transactions, i.e. those in excess of £25,000, or any transactions involving payments of smaller amounts to one single person where in the aggregate those smaller amounts came to £25,000. So that between the time of his note on the plane and actually taking these steps, Mr. O’Connell had lowered the threshold for this examination. An examination of the Woodchester accounts showed that there were no such payments. In order to extend this inquiry, it would appear that Mr. O’Connell, following some discussions with American lawyers involved in the Prospectus, and in addition, having regard to some of the analysis we know he made in the course of his plane journey, made contact with Mr. Aidan Phelan to inquire, were there any other significant accounts operated by Mr. O’Brien? Mr. Phelan’s response was that there were no such accounts. In fact, as I think would now appear from other information made available to the Tribunal, Mr. Phelan appears to have been involved in July of 1996 in arranging for two substantial transfers of £100,000 and £50,000 respectively on Mr. O’Brien’s behalf from offshore accounts in the Channel Islands and the Isle of Man. These payments of £100,000 and £50,000 were made to David Austin and appear, as the Tribunal has already indicated in an earlier Opening Statement, to be connected with a subsequent payment by Mr. Austin to an account in the Isle of Man in the name of Mr. Michael Lowry in the sum of £147,000. Now I come to the inquisition or questioning of the various individuals involved in these payments. This occurred on the 4th November of 1997 in the offices of IIU in the Financial Services Centre. Mr. O’Connell was present by phone. Also present were Mr. Fergus Armstrong and Mr. Michael Kealey of McCann Fitzgerald solicitors. Mr. Arve Johansen, it appears by conference call, and Mr. Knut Digerund of Telenor, who were also directors of ESAT Digifone. Mr. Barry Maloney, Mr. John Fortune, Mr. John Callaghan and Mr. Leslie Buckley, all directors of ESAT Digifone. Mr. Callaghan, Mr. Buckley were also directors of ESAT Telecom. Mr. Gerry Halpenny, solicitor of William Fry, was also present, as was Mr. Kevin O’Brien, solicitor of Kilroy solicitors. Mr. Denis O’Brien was present by phone from the United States. Both Mr. O’Connell and Mr. Halpenny took notes of a discussion, and these notes had been provided to the Tribunal. Mr. O’Brien was examined by Mr. Michael Kealey of McCann Fitzgerald, and it would appear that Mr. Kealey had had no previous and indeed no subsequent involvement with any of the matters under discussion. For the same reasons as I have mentioned before, and because these discussions sought in a forensic way to identify some of the issues involved, it might be useful if I refer to parts of them, or at least the part which contained the main examination. Once again, as is the case of some of the earlier notes, I think, Sir, you should have Mr. O’Connell’s typescript transcription of what transpired. William Fry file note dated 4th November of 1997. A note from Mr. O’Connell to his file. Client is ESAT and the matter is the IPO. It starts off with the names of those present, “Michael Kealey, Denis O’Brien, Arve Johansen, Knut Digerund, John Fortune, John Callaghan, Leslie Buckley, also Fergus Armstrong, Gerry Halpenny, Owen O’Connell, Ken O’Brien. It starts off, and these seem to be Mr. Kealey questioning and Mr. O’Brien answering. And what you have is Mr. O’Connell’s notes of the questioning by Mr. Kealey and of the answers by Mr. O’Brien. And this was to enable Mr. O’Connell to provide himself or arm himself with further information in relation to some of the issues he had identified on the plane, and so that he could take the matter further in advice he gave or any steps he advised the directors of ESAT Telecom to take in connection with this matter. Then, “Barry Maloney error 1st September ’97 conversation. (DOB married 29th August)” In quotation marks, “‘I didn’t actually do it, thank God. I know you must be concerned. '” Then what looks like Mr. O’Brien, “Gave answer re helping out Michael Lowry. Deciding to make payment but never did so. ‘Saw sense.’ frequent conversations with Michael Lowry but no promise or understanding re licence. Michael Kealey – in mind.” I am not sure what that means. Then “Michael Kealey, summary.” Presumably Michael Kealey attempted to summarise the course of the questioning of Mr. O’Brien. Then Mr. Johansen deals with what appears to be some questions concerning his role in the $50,000 payment. “Denis O’Brien and Barry Maloney came to Oslo before Christmas ’95. Topic Barry Maloney contract. Hectic morning. Came from Stockholm, leave early pm. Denis O’Brien took Arve Johansen and (maybe Knut Digerund too) Knut was there partly involved. Mentioned a dinner, just that the feeling was as good corporate citizens, should show appreciation. Give signal were satisfied with performance. Only as a gratuity. No promises or buying favours. Just good thing to do. Fundraising for party. 25K per company – ESAT and Telenor. AJ said okay if DOB thinks right thing to do, will take at face value. K O B” — a reference to Mr. O’Brien, meaning ESAT Digifone, “good corporate citizens.” When I say “KOB,” meaning Mr. O’Brien, I mean Kevin O’Brien, solicitor of Kilroy’s. Arve Johansen: “We didn’t think too much about this. Recent concern that we were the ‘intermediary.’ Barry Maloney: DFTA and Michael Lowry are close personal friends. Arve Johansen: Yes, this could be put in a bad light. Owen O’Connell: Any contact with DFTA after letter acknowledging payment? Johansen: No. Then continuing with Arve Johansen: “Number on Arve Johansen note is Jefferson Smurfit Group. Agreement in subsequent discussion that any participant in meeting who was questioned in a general way at the Tribunal would have to reveal £50,000 contribution. He continues, “Did run most Sundays and shot the breeze, but very clear this was not one of those discussions. Had regular meetings. First reference to two by 100K payments was in context of complaints about payments per bid. Would not have occurred in context of run. Clear two by 100K payments mentioned, one to ML, other never mentioned. ‘Third party intermediary’ consistently used. Woodchester, first referred to 23rd October. Then there is a privileged deletion and a new line, “Apparently Arve Johansen and Knut Digerund have made documents available to Kilroy’s re 50,000. Owen O’Connell – should make available to board as well.” Then there is a privileged deletion. Now, by this time there were discussions between various individuals involved in the IPO with a view to endeavouring to decide how matters should be resolved, whether the IPO should be abandoned, should be postponed, or whether statements should be inserted in the Prospectus to take account of the concerns of Mr. Maloney and a number of other individuals, as Mr. O’Connell’s notes of that examination shows. By the 5th November of 1997, a board meeting of ESAT Telecom was convened for the purpose of resolving how the company should proceed. That meeting was addressed by Mr. O’Connell, who endeavoured to identify the various issues which had to be considered by the directors. It would appear that following that meeting and subject to certain steps being taken, the board decided that they would proceed with the IPO. It would appear that it was resolved that in relation to the Fine Gael contribution, a letter would be obtained initially, it would seem, from Fine Gael, but subsequently from David Austin confirming the transmission of the payment to Fine Gael. In relation to the other issues, the two payments of £100,000, the Board had a decision to make as to whether they would accept Mr. O’Brien’s version, and this, it appears, they did subject to the provision by Mr. O’Brien of an affidavit, the affidavit, which has already been referred to in these sittings, in which Mr. O’Brien confirmed that he had never made the payment for the purpose of securing the licence. Part of the information made available to the directors appears to have included the confirmation from Mr. Aidan Phelan that apart from the Woodchester accounts, and one or two other accounts which were satisfactorily explained, there were no other significant relevant accounts. The further dealings of the directors of ESAT Telecom between themselves and the dealings between the various shareholders in ESAT Digifone concerning the resolutions of these issues may be of some assistance to the Tribunal, but I do not intend to refer to them in any detail at this point. The fact that these issues were resolved or partly resolved by the directors of ESAT Telecom, and the way in which they did so is not of course conclusive where the resolution of these issues in the context of the work of this Tribunal is concerned. What this Tribunal has to determine is whether there were any payments to Michael Lowry and whether those payments were made in circumstances of the kind referred to in the Tribunal’s Terms of Reference, whether, in other words, those sums of money were paid in circumstances giving rise to a reasonable inference that the motive for making the payment or payments was connected with any public office held by Mr. Lowry, or had the potential to influence the discharge of such office, or whether, in more concrete terms, Mr. Lowry made any decision, in this case a decision connected with the granting of the second GSM licence, or any other decision, in return for or otherwise in connection with any such payment.